57 pop-up exhibitions await you across Chiswick, Hammersmith and Shepherds Bush. 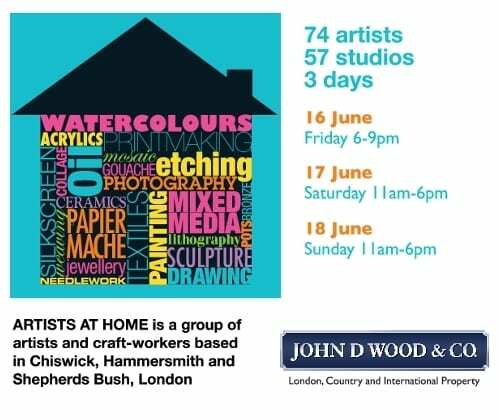 71 artists will be delighted to welcome you to their houses, studios and flats, to view paintings, glass-making, ceramics, printmaking, sculpture, photographs, textiles, and jewellery. This is an exciting chance to discover new original work for your home and to talk to artists about how they create. A fun and lively event with many regular addicted visitors. If you’ve never been before, make this the year you visit! There is a map on the Planning your Route page, which shows the studio locations. The list of artists will show you what you can discover. Don’t forget the houses that seem a bit isolated – they are always worth the extra travel! We are extremely grateful to John D Wood & Co. London and Country Estate Agents, who continue to be our Principal Sponsor. We would also like to thank our advertisers, our designer Jane Davies , The Chiswick Calendar, Snappy Snaps and Bedford Park Festival. 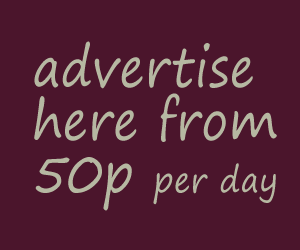 Artists at Home is an annual open studios scheme held over 3 days in mid-June. AAH is run on a voluntary basis by the artists themselves. It began with just a few artists over 40 years ago, making it one of the first of its kind, and has continued to grow ever since. Any serious practitioner in the fine or applied arts living/working in the defined area may apply to join. The discipline might be painting, sculpture, ceramics, textile design, photography, print-making or jewellery but this list is not exhaustive. Work shown must have been produced by the artist; mass-produced objects and work by artists not in AAH are not acceptable.